Asking a toddler to say good bye to their bottles is WAY more challenging than when they are a baby. We all have habits and the longer we have them, the harder it is to change them. By 18 months and older, your little one knows that you love them unconditionally – you have developed an incredible bond over the last year and half to two years. They are feeling comfortable saying NO to you and exerting their will and their independence. Most likely you have already tried to gradually wean them off their bottles. You have probably found that they have not been agreeable to that, and seem even more attached then ever. Please don’t worry if your child doesn’t have many words yet. They will still understand what you are saying – it’s called receptive language. For example, if you say to an 18 month old: “Go get your shoes, we are going to the park”, they will get excited and do so. Even though they won’t be able to articulate “Ok mommy! I will go get my shoes and then we will go to the park”, they still understood what you said and what you expected them to do. To be successful with this age group – as scary as it is – you have to go cold turkey. Meaning no more bottles at all – during the day AND at bedtime. 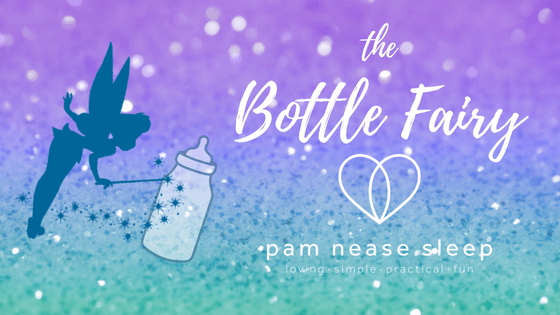 About a week or so before you are ready, start letting your little one know that they are a Big Girl or Big Boy and that the Bottle Fairy will be coming soon!! She will collect all their bottles to take them back to babies who need them. Replace the word “bottle” with whatever name your toddler uses to identify them. Quite often it is the word “bubba”. Please only do this lead up for ONE week (no more), as you do not want to create unnecessary anxiety for your child. Even a few days is fine. Don’t worry if your child does not know what a fairy is either. One adorable couple got all these books and movies to get their twins to understand the concept of fairies first before implementing my advice. Between nap time and bedtime on your fateful day, make it a GAME. Hide all the bottles around the house and have FUN collecting them all with your little one and put them outside on the door step for the Bottle Fairy in a box or a bag. When your little one is not looking, one of you sneak outside and collect the bottles. Replace the bottles with a gift from the Bottle Fairy. I LOVE it when parents go to the extra trouble of putting Fairy Dust and sparkles and wrapping the presents. A good idea is to give them a new special sippy cup from the bottle fairy (not to be used at bedtime though) and a special toy for your child to play with. At bedtime, if your toddler is looking for their bottle, remind them of the Bottle Fairy and that they are a big kid now! Keep focused on making bedtime fun and enjoyable with your books and songs. Do NOT replace the bedtime bottle with a sippy cup of milk, warm cup of milk, a bottle, or even worse – a bedtime SNACK. Please TRUST me on this as it will cause MORE problems down the road. I will be writing another blog post on this very subject and will include a link when it is up. Please trust your precious little one – sleep is all about skill at this age. A little bit of food or milk just before bed will not help them sleep peacefully for 10 to 12 hours. I promise you that as long as you have been following my advice since you hired Pam Nease Sleep, your little one will not wake up hungry in the night. TRUST your little one that they will eventually drink milk from their sippy cups or regular cups by day! In the 9+ years that I have been consulting, 99.9% of toddlers start drinking their milk out of their cups within two weeks of the Bottle Fairy coming to their home. HAVE FUN!!! There was a little boy who received a toddler car that made noise, and he could safely scoot around the house. He LOVED it. His parents were so worried about saying good bye to his bottles – in their words, he was “addicted” to them. Whenever he would say “bubba” during the day, they would remind him that he was a big boy and that the “bubba fairy” came. Within seconds, his tears would be replaced with a big smile and he would go and find his car to ride on. They were amazed on how easily he adapted at bedtime too. Recently – before they hired me – he needed to fall asleep WITH the bottle in his mouth and needed several bottles through out the night in order to sleep. It was not just a “top up” situation. 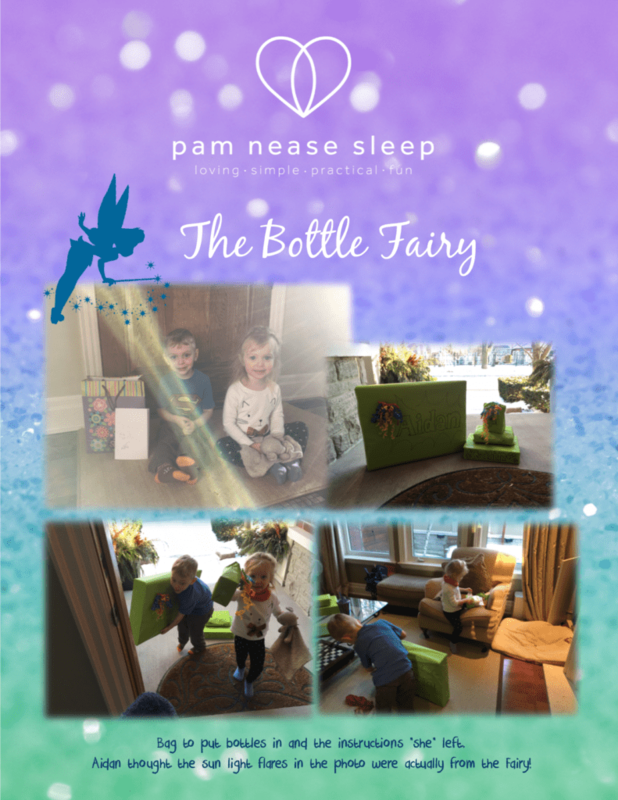 Please note that the Bottle Fairy strategy will NOT be enough to help your little one to be able to fall asleep all on their own and sleep peacefully through out the night. Please get in touch for a complimentary 15 minute telephone consultation so that we can discuss your particular situation and the best possible solutions. We look forward to hearing from you! Need Sleep? Let’s chat personally. We offer a 15 minute complimentary telephone consultation so you can see if we are a good fit for your family. Call me at 250.575.6988 or CLICK HERE to set up an appointment, we look forward to hearing from you! Oh Cheryl – Powerhouse Admin/Department of Everything. I love love love LOVE how you apply your own “magic” and make my words light up on screen for tired parents across the globe. You rock! I used to love watching Jo Frost aka Super Nanny before I had children which is where I got the idea of the bottle fairy and incorporated it into my sleep consultations.